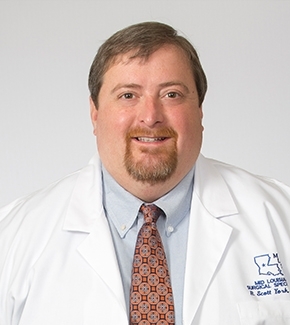 Originally from Fairview-Alpha, Louisiana, Dr. York moved to the area close to ten years ago to practice. Working closely with his patients, he works to find the best possible solution to the needs that they have. Dr. York works to make a direct impact on the patients that he sees on a daily basis. He also wishes to further his skills so that he can provide even more care to patients. Committed to providing quality care for each of his patients, he learns new things every day to do so. In his spare time, Dr. York likes to go golfing or hunting and loves to cook new dishes. His favorite spot is his camp on Little River. During sporting events, he is always rooting for LSU to win. If he was not a surgeon, he’d love to do something in ministry or be a chef. Dr. York took on surgery as his specialty because he enjoys working with his hands and helping people become their best. With a passion for helping others, this is a specialty that allows him to do so. Louisiana College of Surgeons. Cooperates with other professionals and surgeons to work to provide the best healthcare for all patients and clinical settings. Louisiana Medical Society. A statewide effort in providing quality care to surgical patients, as well as a wealth of volunteer opportunities for medical professionals.